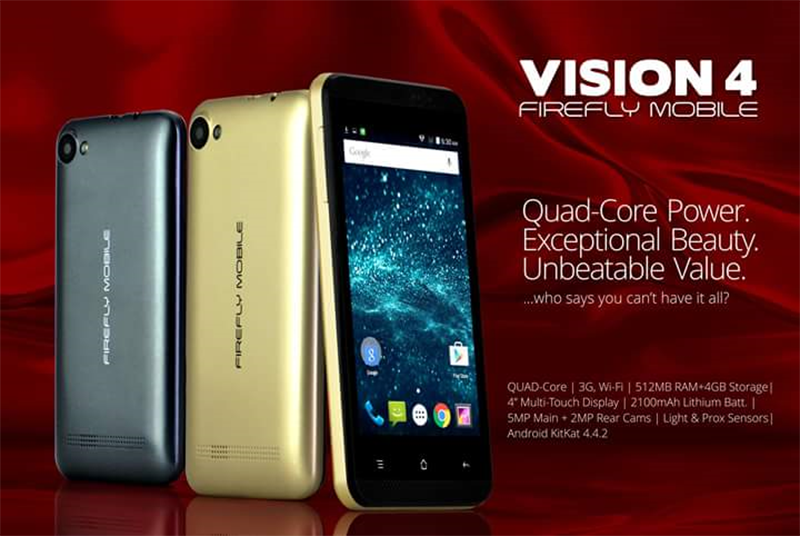 Firefly Mobile Vision 4 Announced, 4 Inch Quad Core With HSPA+ Priced At 1899 Pesos! Home / firefly mobile / mobile / news / Firefly Mobile Vision 4 Announced, 4 Inch Quad Core With HSPA+ Priced At 1899 Pesos! In a recent Facebook post ny Firefly Mobile, they just announced a new entry level smartphone that exceeded all expectations specs-wise. Dubbed as the Firefly Vision 4, this solidly built 4 inch quad core powered phone appears to be the entry level device on a tight budget. It's now available nationwide at all Firefly Mobile stores including some online shops for a very low price of just 1,899 Pesos. The Vision 4 also comes with a free screen protector.